This Saturday, ROC City Roller Derby returns to the Dome Arena and the bout benefits the 678 Program for kids at Genesee Center for Arts and Education. I offered to do the poster and this is what I came up with. I had been reading about Alfred Hitchcock which led to looking as some of his movie posters designed by Saul Bass and I ended up with a Saul Bass themed poster for the bout. It was a lot of fun to work on and I can't wait to see them printed! 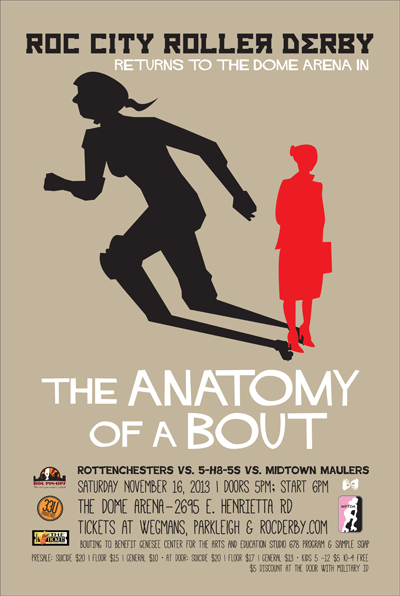 You can find the Facebook event here for The Anatomy of a Bout here and get tickets here.